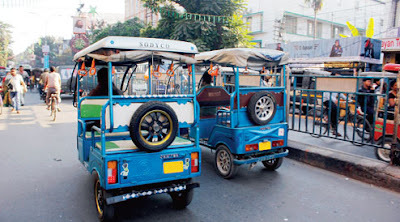 Siliguri: The Darjeeling district administration will regularise the movement of totos (battery-operated rickshaws) in the Siliguri Municipal Corporation area from Wednesday. The administration will, however, stop the running of unauthorised models of the toto which are assembled in Siliguri and are not certified by expert bodies of e-rickshaws of the country. Joyoshi Das Gupta, the district magistrate of Darjeeling, said she had formed a seven-member committee to look after the process of identifying the totos and would issue temporary identification number (TIN) to the owners. "Many unauthorised totos are plying here without following safety norms. No such vehicle will be allowed to operate in and around the SMC area. We have formed a committee, headed by the SDO, that will initiate the registration process of totos from Wednesday. This process will continue till January 30. After the registration is done, all the vehicles will be provided with a TIN," said the DM. Civic, police and transport officials are among the members of the committee. Sources in the district administration said toto owners would have to collect application forms from four locations in the city (the offices of the SDO, SMC, SJDA and Bhaktinagar traffic guard).